As part of a project called Moving the Giants, 350 Coast Redwood saplings arrived in Seattle for delivery to 30 Puget Sound communities during December 2016 thru April 2017. 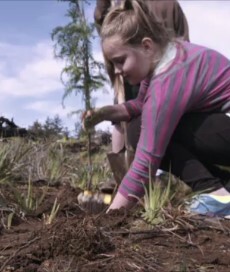 The city of Seattle held their first planting event on December 10, 2016 at Jefferson Park, with the trees being planted by children from Plant for the Planet — a world-wide kid-run organization of 8 to 14 year-olds interested in tree planting, keeping fossil fuels in the ground, and fighting poverty through climate justice. These 350 Coast Redwood saplings have the same genetic structure as some of the world’s oldest and largest trees– trees that have survived 3000 years or more and have the capacity to remove and sequester airborne carbon like no other species according to a team of researchers at Humboldt State University and the University of Washington. 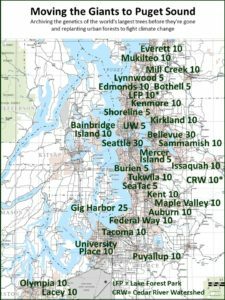 Map of Puget Sound Communities participating in Moving the Giants project. 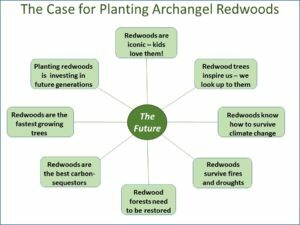 The redwood clones result from the work of Archangel Ancient Tree Archive – a Copemish, Michigan not-for-profit that collects, archives, and propagates the world’s most important old growth trees before they are gone. Their work is described in a 10-minute award-winning film by Michael Ramsey called Moving the Giants – An Urgent Plan to Save the Planet. To view photos and videos from the Archangel Tree Climbing Expedition where plant material for creating the clones comes from, visit my Expedition Blog. To make a donation to further Archangel’s mission, visit Children of Giants. To see photos of redwood sapling deliveries and plantings, visit the Moving the Giants to Puget Sound Facebook page.